Throughout the different ways leading to the Cathedral, the pilgrims pass through lovely places they will never forget. To remember all this, many places (shelters, churches, etc.) 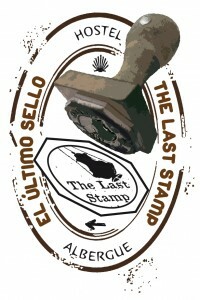 stamp the pilgrim’s credential, which also lets him/her get at the end of the pilmgrinage way “La Compostela”. This document certifies that the pilgrim has completed the way, and to obtain it, the pilgrim must have collected all the stamps in the way and that this was made for religious or spiritual reasons (though currently another cultural reasons are considered within these categories) and that was performed on foot or by horse at least the last 100 km or 200 km when cycling. The name and spirit of our hostel is inspired by this stamps collection process the road and also because we are located in a unique location in the historic heart of the capital, in the French Way, less than 100 meters from the Cathedral of Santiago , the end of all ways, and 300 meters from the point where you get the “La Compostela”, the Pilgrim Office.